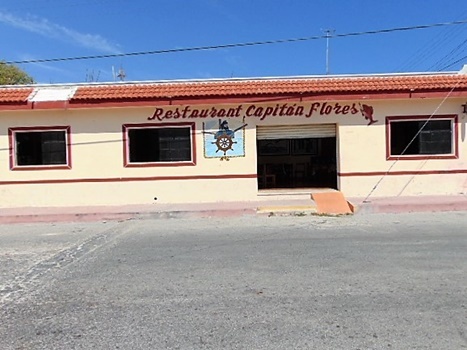 This month I am highlighting Capitan Flores Restaurante in Chicxulub. Gabriela Chan, Entrepreneur and restauranteur. There are many local people directly involved and helping out their community. One of these is Gabriela Chan who owns the restaurante Capitan Flores. Her last name Chan originally came from China she thinks. She is from Chicxulub and has lived her life in the community. She was married to the owner of the well known Los Barriles restaurant in Chicxulub. When they parted some years ago she and her children setup the new restaurant. Her three children are now all adults. A daughter of 22 who is an engineer, a daughter of 25 who is a doctor and her son who is 18 and helps run the restaurant. The restaurant was originally her grandparents house and when they moved to Isla Mujeres she took over the house and setup the new restaurant which has been successful. She is very proud to have her son helping her with the many things needed to be done. She has a great sense of entrepreneurship and positive commitment to her community. She says that the lack of fishing work due to the moratorium has caused difficulties for many. She laments that some have had to do construction or even street cleaning to get by. She heard of the Dispensa and its need for a location to distribute and said she is pleased to participate as she sees her community as one of collaboration. Asked about the participation of foreigners she applauds that as a big help across various parts of the port of Chicxulub. When you are next in Chicxulub consider dropping by to Capitan Flores Restaurant at the corner of Calle 21 y 16 and say hello to Gabriela and enjoy a great meal as well. Feel free to send a story of someone you think is helping the community.